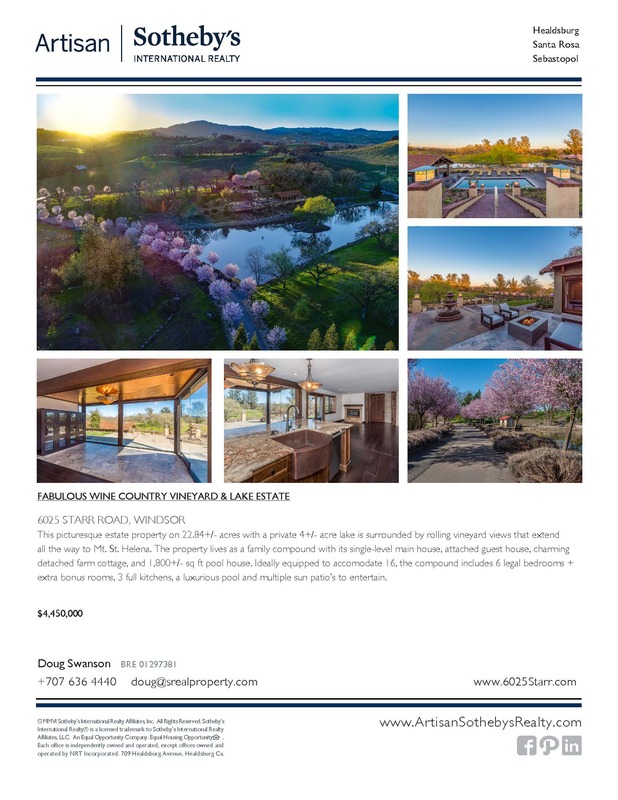 This Fabulous Wine Country Lake & Vineyard Estate overlooks a private picturesque 4+/- acre lake surrounded by rolling wine country vineyard views framed by Mt. St. Helena standing proudly in the distance. The property lives as a family compound with its single-level main house, attached guest house, charming detached farm cottage & 1,800+/- square foot pool house all with 6 legal bedrooms plus extra bonus rooms, 3 full kitchens, luxurious resort like pool and sun patio area all in total capable of sleeping 16 people comfortably. The main home is tastefully adorned throughout with modern amenities, wood flooring, a great-room kitchen combo, chef’s kitchen, granite counters, glass solarium room and much more. The main house offers 3,056+/- square feet with 3 large bedrooms plus an office, all of which have wonderful natural light, open volume and view picture windows. Attached to the main home via a breezeway is a private guest house with 2 large rooms, a walk-in closet, full bath and exquisite wine cellar. 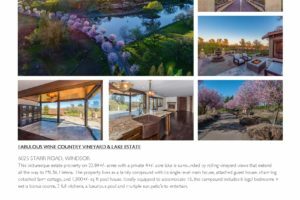 Below the main home is a luxurious pool, sun drenched patio’s, an outdoor kitchen along with a 1,800+/- square foot Pool House complete with a full kitchen and bathroom for entertaining large groups of people overlooking the lake view setting. The pool house can accommodate 100+ person dinner party or charity event all on its own. There is also a 2,500+/- square foot tractor shed/barn with concrete slab floors and roll-up doors. Near the barn is a charming detached 2-bedroom farm cottage with another full kitchen, 2 full bathrooms all tastefully adorned with views that overlook rolling vineyards. As a package this cottage will make lastly memories for your most prestigious guests. 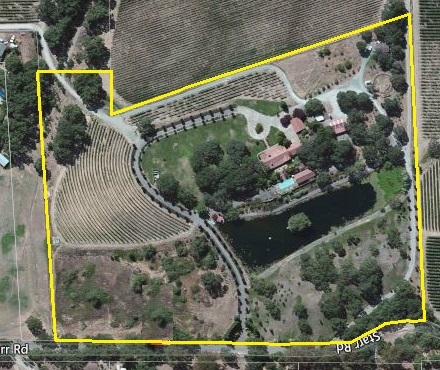 There is a 2.6 acre newly planted hobby vineyard that wraps the properties long flowering tree lined entry drive. The entire parcel encompasses 22+/- acres in total almost all gentle and rolling land. Enjoy being minutes from Healdsburg’s historic town square, Windsor’s family oriented charming town green and just minutes to Santa Rosa’s Airport with its Horizon Air Hub servicing Seattle, Portland, Los Angeles, Orange County, San Diego and more. 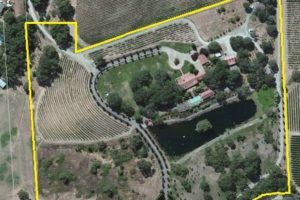 This property is in an ideal location for taking advantage of all that the Sonoma County Wine Country has to offer. To schedule a private tour please contact Doug Swanson cell 707-291-4400.